As an entrepreneur, I found it easy to move from one project or problem to another. When I had to report to micro-managers, I found it most difficult to maintain the excitement and momentum for the project I was working on. No one likes to be micromanaged. It’s frustrating, demoralising and demotivating. Yet, some managers can’t seem to help themselves. Dealing with a controlling boss who doesn’t trust you is tough, but what if you’re the one doing the micro-managing? I know that I am not a micro-manager simply because when I have to manage the detail, is when I feel excessive entrepreneurial pressure. It causes me and others I have worked with or, observed over the years, to carefully analyse the workload involved in a project, before committing to it. If there is one thing that causes me stress and slows me down, it is having a ‘shopping list’ of small, unrelated tasks to the main projects I am working on. In business, micromanagement is a management style whereby a manager closely observes or controls the work of subordinates or employees. Micro-management generally has negative connotations and quickly leads to an unstable and disillusioned workforce. Micro-management restricts the ability of micro-managed people to develop and grow. It also limits what the micromanager’s team can achieve, because everything has to go through the micro-manager. Micro-managing is one of the worst things you can do to an entrepreneur. It is an unproductive level of involvement in their entrepreneurial work. An excessive need for control, nit-picking, attention to unnecessary details is generally an unpleasant overall experience and severely impedes the entrepreneur’s attributes, http://goo.gl/HIjCgb. Attributes that the micro-manager lack and are looking for in the first place to make their projects a success. Don’t let micro-managers stop you finding the magic in your work, business or project. Micro-managers will always tend to stay at the level of competence they understand. They don’t want you to make them look stupid, or you to shine above them. Micro-management is a failed strategy and underlying the need to micromanage is usually a fear of failure. If you have given a good employee, or contractor an important task and a deadline. Do you let them do their work and simply touch base with them at pre-determined points along the way. Or, do you keep dropping by and sending e-mails to check their progress? If it’s the latter, you may be a micro-manager. Or, if you’re the harassed person trying to meet a deadline with a boss hovering over your, you might have a micro-manager on your hands. Micro-manager monitors and assesses every step of a business process. They do this rather than giving general instructions on smaller tasks and then devoting time to supervising larger concerns. They avoid delegation of decisions because of a lack of trust, mostly in themselves because they lack confidence. Micro-managers are usually irritated when a subordinate makes decisions without consulting them, even if the decisions are within the subordinate’s level of authority. A micro-manager tends to require constant and detailed performance feedback and to focus excessively on procedural trivia (often in detail greater than they can actually process) rather than on overall performance, quality and results. This focus on “low-level” trivia often delays decisions, clouds overall goals and objectives, restricts the flow of information between employees and guides the various aspects of a project in different and often opposed directions. Many micro-managers accept such inefficiencies as less important than their retention of control or of the appearance of control. It is common for micro-managers, especially those who exhibit self-important tendencies, or micro-manage deliberately and for strategic reasons, enabling them to both take credit for positive results and shift the blame for negative results to their subordinates. These micro-managers thereby delegate accountability for failure but not the authority to take alternative actions that would have led to success or at least to the mitigation of failure. These tendencies are often displayed by bureaucrats who have little or no practical experience when letting tenders. It happens when the bureaucrat has been given little scope for initiative, or to allow for an entrepreneurial approach. Often you can find things out of balance in your life. They show up in unusual ways or, through abnormal behaviours. Have you ever acted or reacted in a certain way and thought, “Why did I do that? That’s not me”. “Why are people resisting me”? Those are indicators that you might have started to micro-manage. When things are out of balance in your life, it could be time to understand micro-management. When you are out of balance you will begin to do things differently and should be an indicator of a greater problem. Maybe you allow things to frustrate you that normally wouldn’t. Possibly you become mentally “scattered” or “more forgetful” than normal. In some people it shows up as depression or anxiety, in others, it shows up as micro-management. When you won’t admit a mistake or seek advice on a decision. You do not trust those around you enough to delegate responsibility to them. When you are always worrying more about what people think, than what is best. Employees becoming irritated because of your constant interference. When you become a workaholic even to the detriment of your family and personal life. You think the organisation depends solely on you. You feel underappreciated and overwhelmed to the point that you can’t let things go. When the problems get so large you take them home with you. When you try to live behind a wall, never letting anyone know what you really think. The team you lead are always at odds with one another and procrastinating. 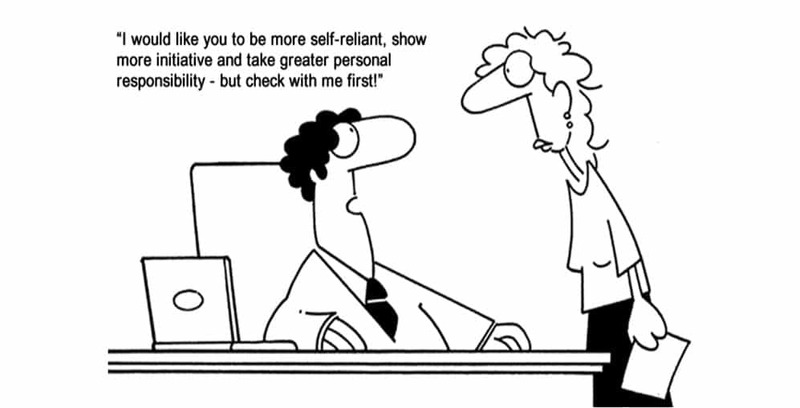 Although micro-managers are often easily recognised by employees, they rarely view themselves as such. 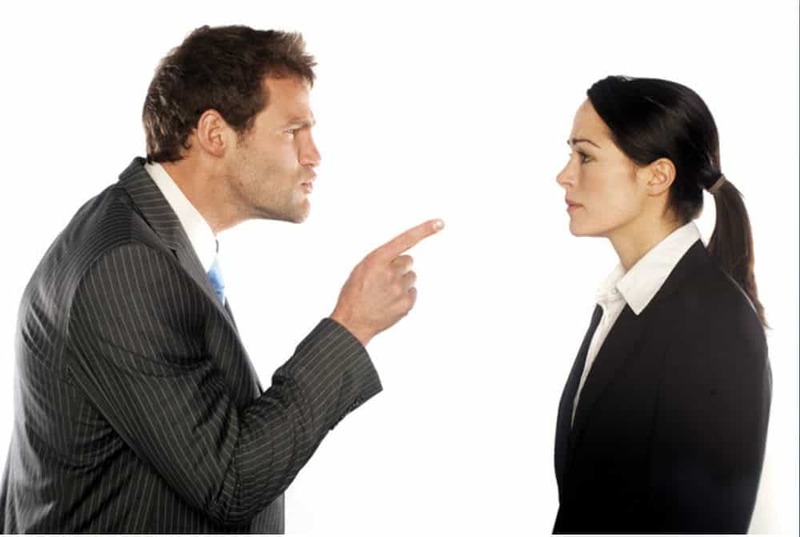 In a form of denial similar to that found in addictive behaviour, micro-managers will often rebut allegations of micromanagement practices by offering a competing characterisation of their management style, e.g. structured or organised. They tend to run group sessions to disguise their micro-management behaviour and avoid negativity that could be directed at themselves. Micro-managers fall well short of other management styles. Unfortunately, there are micro-managers who don’t know they are micro-managers. Micro-managers differ from other more acceptable management styles. Nobody wants to be a called a micromanager. There are many alternative ways of dealing with employees and others that honours who they are and what they know, while at the same time driving engagement and better results. When you have identified micro-management characteristics and observed why they’re so bad, you may find the best way to handle it is to build healthier relationships and learn to collaborate with trust. If you are a micro-manager by making the change to a new style you will find will free up much of your time and greatly improve your own productivity. Start by correcting tiny details instead of looking at the big picture. Stop controlling and funnel information where they think it will do them the best. They want to dictate how to accomplish each and every task based on their past experience. Micro-managers laser in on the details and take great pride in painstakingly making corrections. They resist delegating and discourage others from making decisions without consulting them first. Not being confident or comfortable in the job, constantly asking for frequent updates on where things stand. Constantly wanting to know where all their team members are and what they’re working on. They tend to give detailed instructions and insist on their deadlines being met. Micromanagers tend to concern themselves with regulations, processes and other administrative issues. They are more concerned about the process than the outcome. They don’t expect people to show initiative and want to be cc’d on all emails. Always looking for and finding little mistakes you would probably pick up before a project is finished. They are often frustrated because they would have gone about the task differently. They have mastered follow-up, ensuring that the commitments made have been delivered and there no negative impacts on them. Always insisting on countless meetings and reports. This is so they can stay in control and ensure that processes have been followed and results delivered. They are never quite satisfied with the deliverables. The complexity of today’s workplace, the expectations of workers and the fundamental need to survive, leaves little room for micro-managers. It’s essential for managers to shift their focus away from micro-management and provide the structure and support necessary to help the people they manage to succeed. Management effectiveness means managing less while achieving more. With management effectiveness, good things come to those who believe in what they are doing. Better things come to those who are patient and the best things come to those who don’t give up on their important projects. Overcome your problems, frustrations and burnout by making more time for the activities and people that matter most to you. At the same time, you can free up more time to learn about the things that will propel your business into the future, more profitably and sustainably, http://goo.gl/HGJh4B. Learn how to figure out the most important projects you need to work on in order to achieve your definition of success. “What is the one thing you need to get done next in order to stay on track”? By asking this question you will be forcing yourself to focus on the most important task first. The important things to do today, this week, this month, this quarter and this year. Of course, in order to answer that question effectively, you first need to be clear about your vision for the future so that you have the proper context. Paying attention to details and making sure the work is getting done is always important, so it’s easy to assume that all of the above characteristics are a necessary part of managing. But they aren’t necessary all the time. The problem with micro-managers is that they apply the same level of intensity, scrutiny and in-your-face approach to every task, whether warranted or not. The information and knowledge you gather will help to inform your choice of the most appropriate and effective ways to interact with your employees. Monitor what matters and watch the metrics and indicators that most closely align with success. Take a second look at the way you manage so you don’t become a ‘bottleneck’ in your organisation. You can all rationalise why you do what you do and your management style is no exception. With a commitment to focus on the big picture and on motivating your employees, you can redirect your efforts to be the most effective manager you can be. Most people will know you want to help, but how you help them will make all the difference. People must be allowed to make their own mistakes or, they will never learn or become self-reliant. How am I helping or hindering your progress? What could I do more/less of to support you better? What do you need to continue to grow in your job? Are there any other resources you need? “Don’t ever let someone tell you that you can’t do something. Not even me. You got a dream, you gotta protect it. When people can’t do something themselves, they’re gonna tell you that you can’t do it. You want something, go get it. Period”. Wil Smith.